A flat roof is a roof which is almost level, in contrast to the many different types of sloped roofs. The slope of a roof is known as its pitch, and flat roofs have up to approximately 10° pitch. Flat roofs are mostly used in dry climates, and allow the roof space to be used as a living space, with many flat roofs being used as garden areas. In warmer climates, where there is less rainfall, and freezing is unlikely to occur, many flat roofs are simply built of masonry or concrete, and this is good for keeping out the heat of the sun, as well as being cheap and easy to build when timber is not readily available. In areas where the roof could become soaked by rain, causing leaking, or where water that has soaked in could freeze (causing the expansion of ice to break up the mortar/ brickwork/ concrete), obviously flat roofs are not suitable. The biggest pro is that you are able to make more use of space which would normally be lost with a pitched roof. If you’ve ever been in an upstairs room which has walls with extreme angles, because of the pitch of the roof, you would have noticed the intrusion on the space. Having a flat roof eliminates this issue and can allow for more space. This makes it possible to use the extra space on smaller structures such as extensions, porches, and garages. Walls with pitched roofs, especially those with extreme pitches, can greatly reduce the amount of usable space in a room. 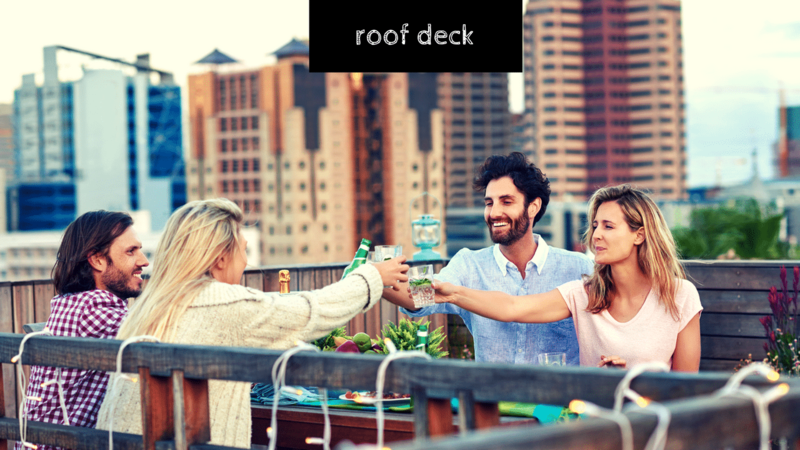 Externally, flat roofs can allow for entertaining space with a rooftop deck or patio. 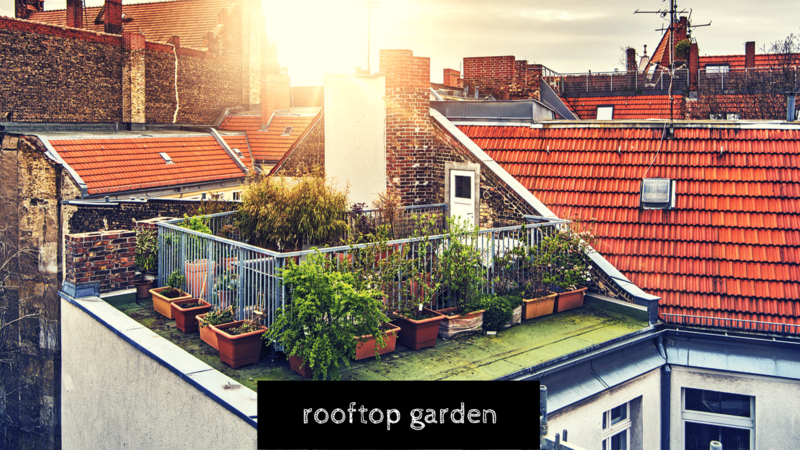 Many flat roofs are also used as gardening areas, and you can imagine the advantages of having a garden in a built up area, which would have been very limited otherwise. Flat roofs are cheaper to install because they need less materials. There is the reduced cost of not using rafters etc. which are needed for pitched roofs, as well as the greatly reduced time taken to install them. The cost of the materials themselves is a lot less than the materials needed for a pitched roof. In addition, the property’s footings do not need to be as deep as with a pitched roof, as a flat roof does not place the same amount of burden on the building’s foundations. A roofing/building company’s insurance is cheaper when installing flat roofs than when installing pitched roofs because it is harder to fall off a flat roof! This should impact on the overall cost of the job. Complete roof replacement can often take just a day, thereby heavily reducing the cost of replacing your entire roof. Flat roofs are easier to install because they lack pitch. This makes it easier for the roof to be installed. They also lack the rafters, trusses etc. that pitched roofs require, making installation a lot quicker. Known for their space saving and compact design, flat roofs are particularly good for smaller structures, such as extensions. It is much easier to design structures with flat roofs, for maximum use of space. LEAKING: Water on a flat roof tends to build up and then soak down into the house. The insulation is affected, and, if using organic material for insulation, it usually needs to be removed and replaced, as generally, it would end up becoming mouldy if left for long. Mould spores develop, which becomes a health risk when breathing them in. The cost of the damage can be huge. 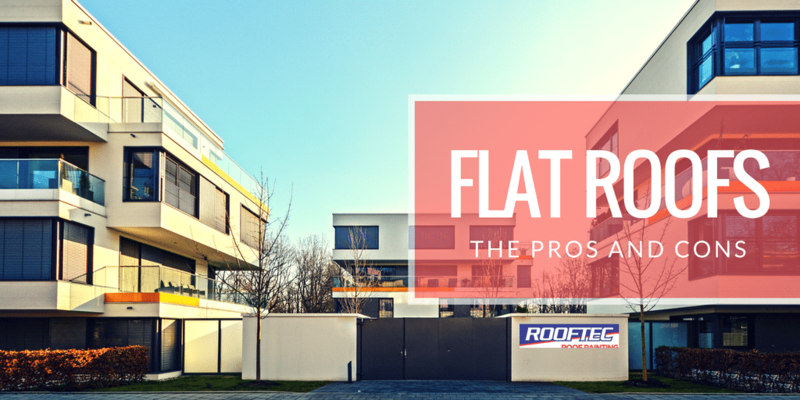 Flat roofs are more prone to leaking. Insurance companies take this into account and often raise their rates accordingly. HEAT ABSORPTION: A flat roof is designed to absorb heat. Because of the lack of pitch, the entire roof is exposed to the sun all day long. While this sounds good for winter, the winter sun is at the lowest point so there is a minimal amount of sun compared to the summer months, when your home is receiving the full blast of the overhead sun all day. MAINTENANCE: Both flat and pitched roofs require regular maintenance. However, due to the nature of the slope, flat roofs often require more maintenance throughout the life of the roof. Flat roof drainage is not quite as effective as that of a pitched roof, and without regular inspection drains can become blocked, leading to damage and leaks. REPAIRS: The roof requires a waterproof seal, which must be maintained regularly to prevent leaks and expensive repairs. Many flat roof leaks are due to a lack of regular inspection and maintenance, so ensure that you make the time to regularly check your roof. ** An important point to note: Because installing a pitched roof may result in issues with the depths of your property’s footings, as it places a greater burden on the building’s foundations, if you want to replace an existing flat roof with a pitched roof it may not always be possible – and if it is possible, it could require some major earthworks to strengthen the footings. Always consult with a roofing contractor to determine which roofing option is best for your individual needs. At Rooftec Roof Painting and Restoration, your Newcastle and Central Coast Roofing Specialist, our roofing experts will assess your roofing needs and will discuss a solution. Ring us on (02) 4944 2010 – or complete your details on our Home page – for a free quote. Whether repairing or replacing your roof, our roofing experts are here to help you. Remember – we have over 25 years’ roofing experience in Newcastle and the Hunter Valley, and all our work is backed by a 10-year guarantee!